If you are thinking about upgrading your bedroom with a new mattress that feels like a dream, congratulations! There’s no better investment than the one that goes to benefit your whole body, allowing you to rest, relax, and prepare for the challenges of a new day. You have probably heard about the mattress called a latex hybrid mattress, but what is a hybrid mattress exactly, and is latex better than memory foam? Here is all you need to know. What is a hybrid mattress made of? If you have successfully assessed that it’s time to buy a new mattress, you’ll surely want to take the time before your next mattress purchase to do your due diligence as far as research goes. A quality mattress isn’t just a skin-deep comfortable luxury; it represents important support for your back, and in the long run, it can raise the quality of a sleeper’s life significantly. So, what is a hybrid mattress actually made of? It all starts at the core, with the support steel coil system. It’s designed to offer stability and pleasant firmness, but still leave room for flexibility that ensures comfort. The finest models come with individually wrapped springs, which provide additional relief. The next is the comfort layer, which can be made from different materials, including memory foam, polyfoam, latex, or other fabrics. The most comfortable hybrid mattresses have a top layer made of cotton, a natural material that’s soft, breathable, and pleasant to the skin. 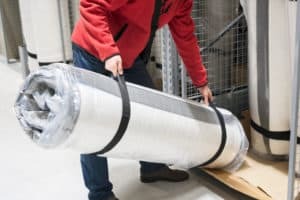 Hybrid mattresses, as their name suggests, are made as a combination of two different mattress systems, allowing the sleeper to get the experience experts like to call the, “best of both worlds”. The comfort of a traditional spring mattress is successfully combined with the pleasantness and benefits of natural materials, creating a soft, durable surface that feels wonderful both on your skin and under your back. What is a latex hybrid mattress? A latex hybrid mattress is, as mentioned above, a form of a hybrid mattress with the comfort layer made from natural latex. Such a combination of materials results in a great experience, and latex is the material that ensures utter comfort and assists natural spine alignment. It’s also a natural allergen-free material that’s highly durable, putting it right in that sweet spot of being a long-lasting and environment-friendly solution for your bedroom. Latex is a completely natural material that is made from the sap of the rubber tree. Thanks to its origin, latex is very elastic, which is why mattresses made with this material have the ability to shape perfectly to the contours of the body. Latex hybrid mattresses usually come at three different firmness levels, plush, (the softest one), medium, and firm. Depending on your sleeping position, movement, weight, and personal preferences, you can choose one of the available options, guaranteeing yourself a high-quality, rejuvenating sleep. Who are hybrid mattresses best for? Although different consumers swear by this mattress type, hybrid mattresses seem to benefit those who like to sleep on their side the most. 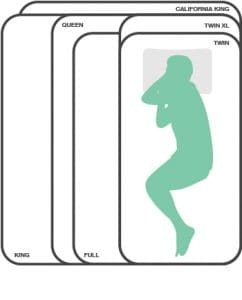 Side sleepers often suffer inconvenience, as sleeping in this position generally intensifies the pressure on two main points: the shoulder and a hip. With latex hybrid mattresses, the soft, flexible materials give in under these main pressure points, but the coil system, on the other hand, keeps the structure steady and solid, keeping those other parts supported as well. In addition, a hybrid mattress can significantly reduce the effects of active movements from a partner who changes their position a lot during their sleep, this being due to a hybrids incomparable motion separation. This is why hybrid mattresses are also the best choice for couples who have different sleeping habits, allowing both partners to get a good night’s rest. What is the best hybrid mattress? Recognizing the best hybrid mattress takes knowing a few tips and tricks, and some testing out to see what fits your body the best. Have you heard that the firmer the mattress, the better it is for your spine? It’s time to eradicate such prejudice, as no two bodies are the same, and you will need to test a few mattresses out to discover which type of firmness works the best for you. How to recognize if a mattress is too soft for you? If you lay down and the middle portion of your body just sinks into it, it signals that such a mattress doesn’t offer enough support for your back. Whether it’s a mattress you already have or the one you just tried at the store, it’s time to get up and go for the next option. What happens if the mattress is to firm? Lay on your side, and pay attention to how your hip and shoulder feel. If the mattress doesn’t give in at all, avoiding to somewhat adapt to the shape of your body, it’s way too firm for you. Next, please! How does it feel when the mattress is just right? If the mattress gives in under you, allowing you to feel its softness and comfort, but you can still sense the solid support underneath your body, you’ve got it – this one’s a keeper. Firm mattresses are usually the best choice for persons that weigh over 200 lbs. Finest craftsmanship and uncompromised quality: what’s the best mattresses for your San Diego home? Buying the best hybrid mattress with latex padding doesn’t sound like an important venture, but you can take our word for it – it matters more than most would think. We are Mattress Makers, a family business dedicated to the art of creating durable, comfortable and supportive mattresses you will love at first touch. A good night’s sleep can have a miraculous effect, leaving you energized like never before, ready to get up and take the day on, feeling refreshed and well rested. Pack a backpack and spend the day in the beautiful natural environment of Torrey Pines State Reserve. When you come back home and get ready to lie down again, our heavenly, well-supported padding will help you rest and enjoy every second of it. Do you have any questions, such as what a pocketed coil is, what a split-king mattress is, or how to know when to rotate your mattress? Give us a call or drop by our store. We’ll be more than happy to help you out!